Sho書 (as it is referred to in Japan; Ch shu) is the simple exercise of writing kanji 漢字 (Ch hanzi or ideograms) and phonetic scripts such as Japanese kana and Korean hanguel to communicate thoughts, express feelings, and share information. The origins of kanji can be traced to pictographs inscribed on bones, turtle shells, and other surfaces used for divination that articulated an ancient people’s yearnings for bountiful harvest, aspirations for health, safe passage through life, and prognostications for initiating war. Over the course of centuries, their numbers proliferated, along with regional variations. Thus, among the many reforms Qin Shi Huangdi 秦始皇帝 (r. 221–210 BCE), the first Qin emperor, initiated after unifying China, was to standardize the script for ease of communication, to expedite trade, and to facilitate taxation. While kanjis may have been originally inspired from images from the natural world (it is possible to discern the objective source of some ideograms), they are abstractions of objects, sounds, feelings, and ideas. The art of sho can thus be properly called abstract art. In traditional China, the mastery of sho (書法) was one of the four measures of scholarly accomplishment, and considered to be a vehicle for spiritual cultivation and for giving form to the formless beauty of the creator-artist’s inner life. An appreciation for the art and aesthetics of sho is a window to East Asian ideas of beauty, its spiritual culture, and its traditional educational pedagogy. Modern aesthetic interests in sho emerged in the early twentieth century, when after nearly 300 years of limited political and cultural exchange, Yang Shoujing 楊守敬 (1839–1914) was posted in 1880 to the Chinese Embassy in Tokyo. The diplomat introduced some 13,000 takuhon拓本 (frottage, ink rubbings) samples of kanji and seal scripts from the Southern and Northern Dynasties period (third to sixth century) that were heretofore unknown to the Japanese. Differing from the staid formal styles that were being taught and used, these samples, especially those from the fringes of Chinese culture, stirred the creative imaginations of Japanese sho-artists. This aesthetic quickening prompted, Hidai Tenrai 日田井天来 (1872-1933) to initiate a modernist approach by advancing the idea of sho as “the art of the line,” freeing the craft of writing to a genre of art. As a result, sho-artists began to explore the expressive potential of the brush, to “play” with the structure (form and stroke order) of ideograms, and to experiment with different textures of ink, paper, and writing formats that would eventually lead to creating ink-forms 墨象devoid of literal meaning. Hidai’s exploration centered on the study of the masterworks of sho, and on the traditional notion that the brushstroke crystallizes the writer’s total being. In 1933 Hidai’s disciples established Shodō Geijutsu-sha 書道芸術会 (Shodō [Calligraphy] Art Society), whose members would forge the postwar avant-garde sho movement. Hidai’s disciples, Ueda Sōkyū 上田桑鳩 (1899-1968) and Hidai Nankoku 日田井南谷 (1912-1999) worked to detach sho from the formal restrictions of the kanji by focusing on line and form and through the use of non-traditional material. The founding of the Shodō Geijutsu-sha also saw the launch of Shodō geijutsu 『書道芸術 』(Shodō [Calligraphy] Art), the first periodical devoted to the theorizing on the art and craft of sho, publishing images of new work, and engaging Western art and aesthetics. Continuing Hidai’s efforts to modernizing the tradition, in 1940 Ueda, who founded Keisei-kai奎星会 (Star Society), sought to deconstruct the kanji as a symbol by the unrestricted use of line and form. However, it was Hidai Nankoku who made the leap to sever sho from the literal confines of the kanji with心線作品第一・電のヴァリエーション(Mind/spirit-line Number 1: Variation on Den [Lightning]). Drawing inspiration from an archaic form 電, den or “lightening,” Nankoku created what appears to be aquatic life forms carousing in a tank. The work provoked controversy, when it was exhibited at the Gendai Bijutsukyōkai-ten (Modern Fine Arts Society Exhibition) in 1946. Unrecognizable as a kanji, it raised the question: what is it sho? Freeing the tradition from constraints of the written word, Nankoku introduced the possibility of a new genre. In contrast, Ueda’s Kyoto based students—Morita Shiryū 森田子龍 (1912-1998), Inoue Yu’ichi　井上祐一(1916-1985), Eguchi Sōgen 江口草玄 (1919-), and Sekiya Yoshimichi 関谷義道 (1920- 2006)—founded Bokujin-kai 墨人会(People of Ink Society)in 1952 and continued to explore the expressive potential of the brush and of ink through the formal confines of the kanji. Morita continued to advance the traditional notion that the written word provided the occasion to cultivate, explore, transform, and give form to the sho-artist’s inner life. In 1951 Morita issued the first issue of Bokubi『墨美』that featured the work of Franz Kline (1910-1962), highlighting an interest beyond several millennia of tradition. Bokubi would go on to feature lesser-known masters; it ceased publication in 1981after 301 issues. Keisei-kai and Bokujin-kai artists were not alone. Independent artists such as Teshigahara Sōfū 勅使河原蒼風 (1900-1979), the founder of the Sōgetsu School of Flower Arrangement, and Shinoda Tōkō篠田桃虹 (1913-), who at 103 years is still actively continuing her aesthetic activities, moved beyond the formal structure of the kanji and shifted their attention to the interplay of line and space. Japanese sho-artists were drawn to the non-representative subject matter of modern art and the spontaneity of the creative process in the action paintings of Abstract Expressionism, exemplified by Jackson Pollack (1912–1956), Franz Kline (1910-1968), and others. Many Western artists in turn took interest in the expressive spontaneity of zenga 禅画 (Zen paintings) and Zen-inspired sho. Additionally, D. T. Suzuki (1870–1966) through his writings and lectures on Zen and Zen culture at Columbia University between 1952 and 1957 influenced many artists, poets, writers, and composers. This aesthetic convergence resulted in exhibitions that highlighted the spontaneity and expressive possibilities of the creative act to mirror the inner life of the artist. Some of the more prominent exhibitions were: the 1955 Japanese and American Abstract Art Exhibition at the National Museum of Art in Tokyo; the 1956 and several subsequent Sao Paulo Biennale Exhibitions; the 1960 Sinn und Zeichen and Schrift und Bild in Germany. After this initial rush, interest in avant-garde sho and abstract expression waned in Japan and in the West. However, in 2009 the Guggenheim Museum in New York City hosted a restrospective, The Third Mind: American Artists Contemplate Asia, 1860–1989 that featured the impact of Zen culture on Abstract Expressionism. Just as a geographer studies the features of the Earth and the impact of human activity on its physical landscape, the study and appreciation of sho entail the study of the visual features—line, space, and time (rhythm)—that emerge as the brush moves across the writing surface. Lines can be hard and cold, soft and warm, dynamic, bold, and fluid. Still others display visual qualities of strength, vigor, steadfastness, profundity, and playfulness. Space, an essential aesthetic quality, is not a passive medium in which forms are located or where events occur; rather it defines and is the source from which form emerges. Form in turn creates space, giving it meaning and efficacy. The pliant brush, free flowing ink, and absorbent paper are the ideal tools to trace the breath and physical rhythm of the sho-artist’s mastery of the craft. A singular temporal and spatial event, the hand-written word or a simple line reveals the inner life of the writer—feelings, thoughts, and memories. Giving expression to the sho-artist’s formless and a-sensual spiritual geography, the hand-written word reveals the contours of the creator-artist’s kyōgai or “spiritual-dwelling-place.” The aesthetic quality in the art of sho is also concerned with the spiritual geography of the sho-artist. Hakuin’s works exhibit no skill, no seasoned maturity, no quiet simplicity, no refined dignity, no ornamentation, no beauty; they exhibit only strength and some uncommon quality. I sense in his sho and ink-sketches an incomparable strength that transcends all places and all time. Might these qualities be expressive of an unsurpassed beauty that escapes ordinary intelligence or knowing? Sho is the art of formless-form. As a vehicle for discovering, nurturing, and giving form to the sho-artist’s formless spiritual-dwelling-place, Hakuin’s bokuseki 墨跡or “ink-traces” chronicle moments in a life-long pilgrimage of self-cultivation, self-transformation, and self-realization. Transcending formal aesthetic values, formless-forms have the capacity to embrace and draw the viewer into a rarefied world. The traditional method for studying sho is rinsho臨書, “seeing” 臨and “writing” 書. “Seeing” involves an appreciation of the art and craft of sho through the study of exemplary samples of kanji and kana, and more importantly through them to glimpse the inner life of their creators. “Writing” means executing with the soft brush the forms and lines that are observed. The intent of this pedagogy is: (1) to learn to use the brush by replicating the calligraphic lines and forms, including stroke order; (2) to appreciate such aesthetic characteristics of strength, vigor, steadfastness, rhythm, and playfulness that are associated with line and to recognize vitality, fullness, and other aesthetic qualities commonly used to describe space; and (3) to enter into the kanji samples and through them the life of the sho-master. Through repeated seeing and writing exemplary samples of kanji, the student learns the technical aspects of the craft, including adapting the operation of the brush to the ever-changing viscosity of the ink and idiosyncrasies of a variety of writing surfaces. The study and understanding of earlier forms and techniques are the foundation on which the sho artist experiments with the craft to initiate innovation. Hidai, who initiated a revolution, and his followers, all emphasized the study of masterworks. The intent of this rinsho pedagogy is for the student to understand his or her place in the history and tradition of sho and to embody the tradition and the art. When Shih-t’ou, the famous Ch’an Buddhist painter of the seventeenth century, held a brush in his hand, the work which he produced was pure subjectivity identified with pure objectivity. At the moment when he painted the objective, natural symbols of trees and mountains, he painted his own purely subjective being. Operationally, in the same manner, the sho-artist identifies with the kanji or kana he or she chooses to write. When the kanji/object becomes part of his or her being, it is expressed with authoritative confidence. During these moments, the subjective reality of the artist appears on the writing surface. Subject and object are identical. 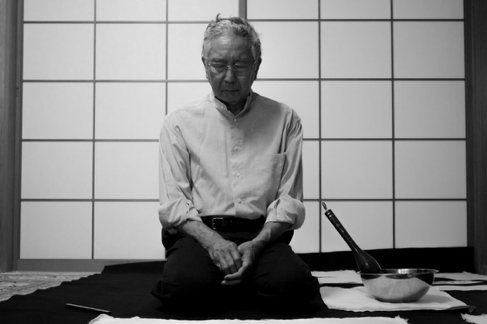 Beyond the technical explorations of the brush and the aesthetic features of line, space and time, the pedagogy of rinsho is an opportunity for the student to enter into a relationship with past and present masters of the art and to peer into their spiritual landscape. Ink flowing freely from a supple brush onto absorbent paper is a most suitable medium for giving form immediately and directly to the artist-creator’s a-sensual beauty. Such authentic expressions are “flawless,” transcending any visual and aesthetic imperfection; they have the capacity to embrace and draw the viewer into a rarefied realm. The present-day sho-artists continue the legacy of Hidai Tenrai, who understood the ancient tradition to be the “art of line.” This aesthetic assertion led his students to diverge into two major movements. Personifying one movement, Hidai Nankoku freed the tradition to explore form and space, devoid of the literal meaning. Second, unwilling to abandon the kanji, Morita Shiryū pursued the art of sho within the limitations of the literal form. The non-figurative, non-objective, and non-representational kanji and non-literal ink-form frees the brush-wielding artist to cultivate, explore, and to give form to his or her formless inner life. For both movements, the writing with an ink-laden brush is the vehicle for self-exploration, self-expression, and self-transformation. The inspiration for each of the movement is sho-masterpieces. The typewriter and now digital means of producing the written word have eroded the wisdom and effort of learning the value of the hand-written “word.” The rinsho exercise may be an anachronism meant for a different age. The other three were proficiency in the qin 琴 or zither; qi 碁 or bead-board game; and hua 画 or painting. In the waning decades of the 19th century, sho was not considered to be art, at least to Koyama Shōtarō (1857-1916), an early yōga or western-style painter, who stated, “sho is not art.” Koyama viewed the writing of ideograms and syllabary to be utilitarian. This led to rebuttal by Okakura Tenshin (1862-1913) in an 1882 article, “書は美術ならずの論を読む” (Reading ‘Calligraphy is not Art’”). A translation by Timothy Unverzagt Goddard appears in Review of Japanese Culture and Society, December 2012, 168-175. Hidai Nankoku. Mind/spirit-line Number 1: Variation on Den (Lightning) 心線作品第一・電のヴァリエーション. 1945. Ink on paper. 16¼ x 24¾. Chiba City Art Museum. For overview of the history of the post-war history of sho see: Alexandra Munroe. “Circle: Modernism and Tradition.” In Japanese Art after 1945, Scream against the Sky. New York: Harry N. Abrams, 1994, 129-132. Kanemitsu, Masami, and Mortia Shiryū. “Obei o katari Nippon ni negau (Reflections on the West, Imploring Japan).” Bokubi 147 (1965): 30. Morita describes in detail what he means by inochi. See Sho—ikikata no katachi. Tokyo: Nippon hōsō shuppan kyōkai, 1968, 155-159. Yamamoto, Hatsujirō. “Hakuin geijitsu no tokuisei (The Wonder of Hakuin’s Art).” Bokubi 78 (1958):13. See Morita, Shiryū, ed. Hakuin bokuseki (Ink Traces of Hakuin): Compilation and Reprint of Bokubi, vols. 77, 78, 79, and 90. Kyoto, Japan: Bokubisha, 1977. This is a reprint of four earlier volumes devoted to different phases of Hakuin Zenji’s life. Also Takeuchi Naoji, ed., Hakuin. Tokyo: Chikuma, 1964. Chang, Chung-yuan. “On Stephen C. Pepper’s ‘On the Uses of Symbolism in Sculpture and Painting.’” Philosophy East and West XIX, no. 3 (1969): 281.